Students came up with all the definitions they could think of for “peace” and “conflict,” including activities related to an “active peace” and “constructive conflict.” Then the fifth graders imagined ideas for visual symbols that could reflect “webs of related ideas” accommodating many points of view. 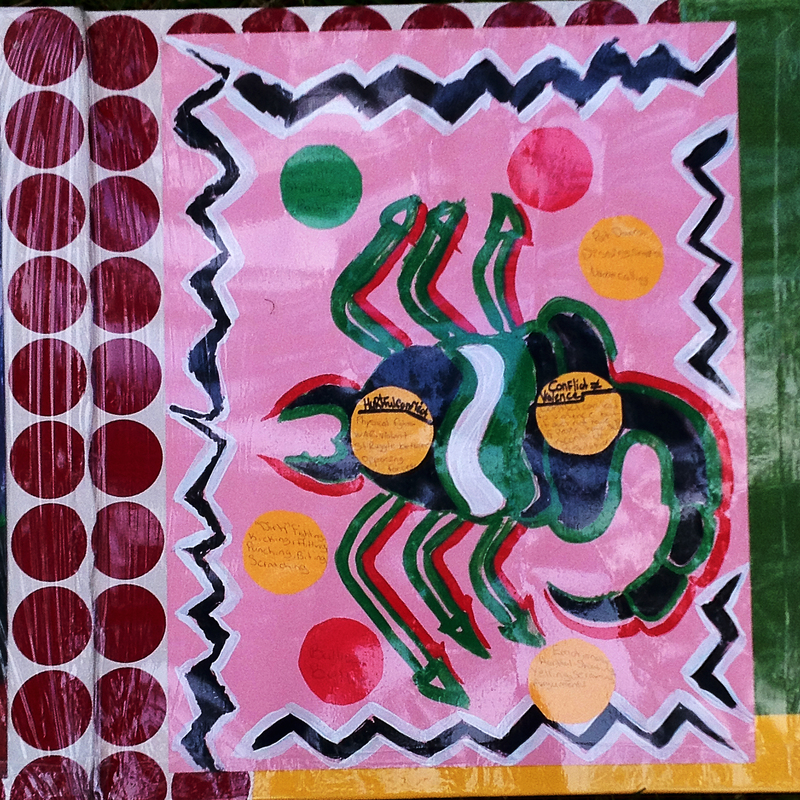 They decided to draw, collage and paint a poisonous scorpion symbolizing dangerous and hurtful conflict; and a garden spider representing constructive conflict that allows one to grow. They also came up with a pizza pie. One of the slices represented sharing good food at a lunchtime picnic, like we did during the Health Festival. Favorite foods and being outdoors always made the students feel at peace with the world. They were even willing to share with the inevitable ants, which are pictured! At the Annual Health Festival in the neighborhood park, a block from their school, students offered their services as Peer Mediators. Interested audience members sat in Angel/Devil Chairs the students also created, and the Youth Mediators talked them through each step, striving to resolve their dilemmas. The student drawings (documented here) were shared in an 8-page, 28” x 30” accordion book. 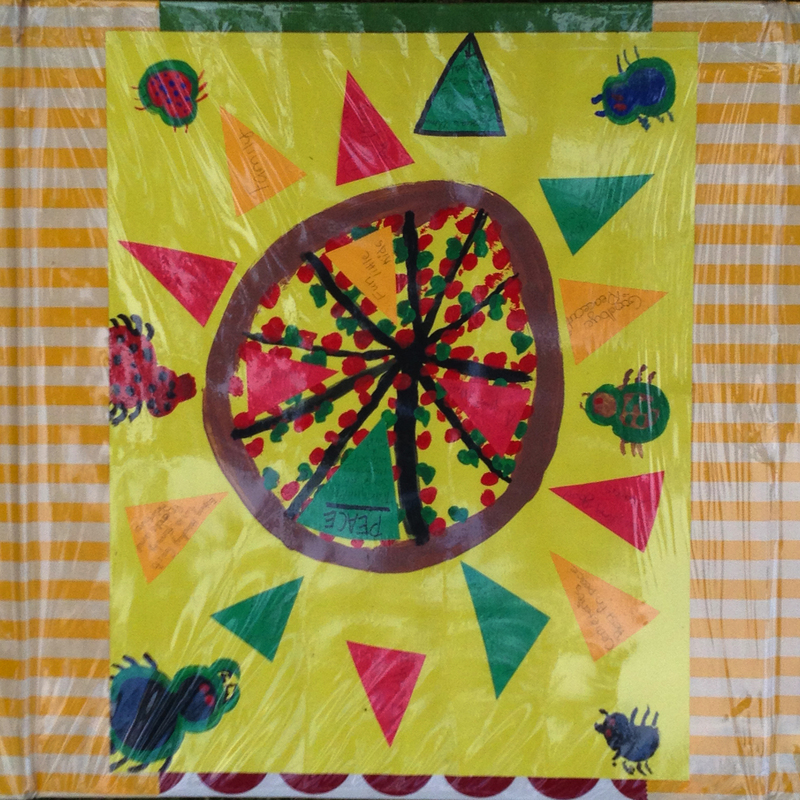 For 4-years, Allyn facilitated art projects with students in various classes, during or after school, at PS33 elementary school (1998-2002). 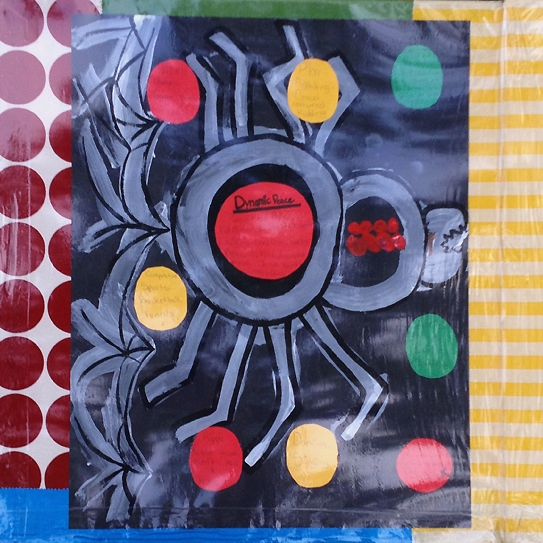 These projects included a colorful human-sized Labyrinth tied together with strips of recycled fabric (from all participants) – that the students loved dancing and jogging through. Another project included a 20′ foot sports Mural on a gym wall, inspired by Romare Beardon. The mural was painted by 4 students at a time, and reportedly became an inspiring backdrop for team sports at PS33. 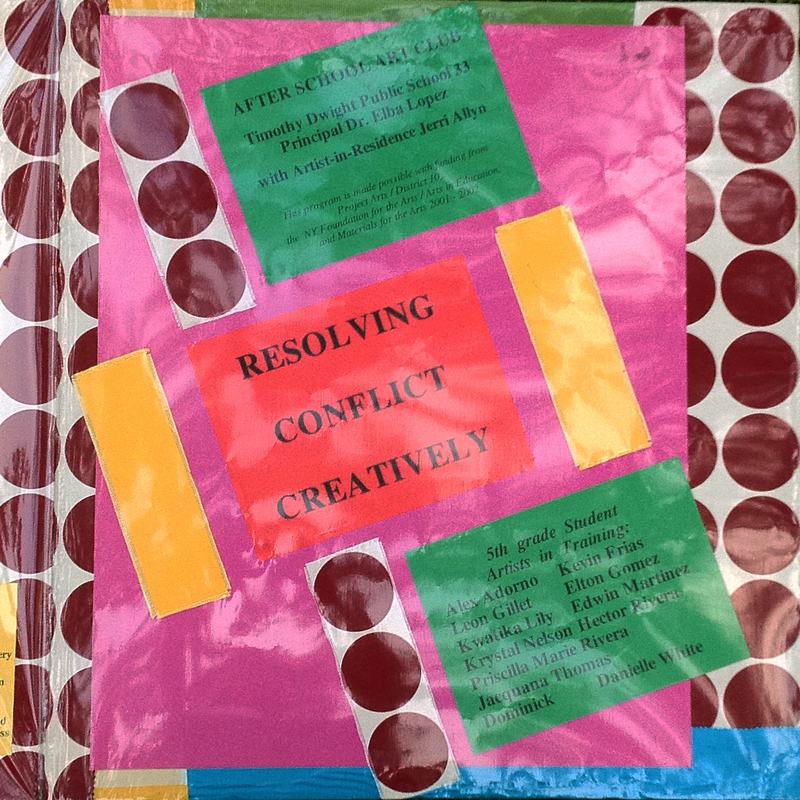 In 2001, Allyn received funding to offer a special program-Resolving Conflict* through Art-peer mediation training with companion art lessons. These were offered for two seasons, in conjunction with her art installation, A Chair is a Throne is a Freedom Fighter’s Camp Stool, about the same topic. Funded by Artist in the Schools Community Program, NY Foundation for the Arts, and Project Arts District 10.